From left to right: Bachelor of Oral Health student Jenny Lam with Jenny Morgan, Colgate Oral Care, and Professor Mike Morgan, Head of Melbourne Dental School. Image: Brenda Masters. 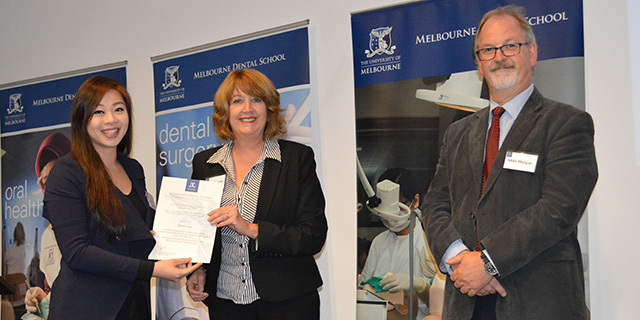 On 11 May, the Melbourne Dental School held an award ceremony for Doctor of Dental Surgery and Bachelor of Oral Health students at the University of Melbourne. Hosted by the Head of School Professor Mike Morgan, the event was attended by students and award recipients, their families, donors, partner organisations and School staff. “We congratulate you on your important academic achievements and wish you continued success in the future,” Professor Morgan said. He also thanked the generosity of donors who sponsored 33 student prizes, and for their investment in dentistry and oral health. Dr John Rogers, a specialist in public health dentistry and Principal Oral health Advisor from the Victorian Department of Health and Human Services, gave the occasional address. Several Doctor of Dental Surgery students achieved outstanding results, winning multiple awards. David Zhang scored 4 prizes; Madeleine Duff, Daniel Beteramia and Sheryl Chew were awarded 3 prizes; and Julian He and Brett Borger won 2 prizes. Find out more information about studying dentistry at the University of Melbourne at http://dental.unimelb.edu.au/#study.